Unfortunately, too many project professionals define success solely in triple constraint terms. It’s good to deliver your project on time, on budget and on scope. But what if your end customer is disgruntled and refuses to learn the new process? That’s a bad sign – you could even call it project failure. It’s understandable that you have focused on the technical project management skills. Many project managers cut their teeth in technology projects and construction, industries that prize technical expertise. Project management certifications, books and courses often emphasize these skills (e.g. Amazon has over 1200 books on Microsoft Project). The dark side of technical knowledge is that you miss the big picture. You ignore strategy announcements from the CEO because you’re concerned about your budget. You spend hours standardizing fonts in PowerPoint presentations to meet corporate standards (I’m guilty of that!). Fortunately, we can draw hope and inspiration from our friends in accounting. Accountants start their careers with very technical training. Yet, there are accountants who join the executive ranks every year. Those who make the switch understand that technical expertise is the start of the journey, not the end. Project professionals need to learn how to made a similar evolution. IBM’s commitment to project management has rightly become famous throughout the technology industry and beyond. Here is how IBM connected project management to the organization’s strategy. As noted in IBM: Keys to Building A Successful Enterprise Project Management Office published by the Project Management Institute. In the 1990s, Gerstner established an executive steering committee to promote project management. Strategy is partly a question of emphasis and deciding where to allocate resources. IBM leadership made a clear decision to elevate project management and use a project approach to transform the company. Explicitly Link Project Management To Corporate Strategy. In some organizations, strategy appears to be a theoretical exercise divorced from day to day work. In 2011, IBM’s project management leadership linked their efforts to IBM’s Roadmap to 2015. From time to time, strategy changes – remember to adjust to stay in alignment. Don’t make the mistake of assuming that projects are automatically in alignment with strategy. Build Corporate Memory Of Best Practices. Substitute “before your were born” with “before your project began” and you can easily apply Cicero’s observation to organizational life. The opposite of project management maturity is a childish lack of focus. Strategy recognizes the importance of ideas AND follow through. 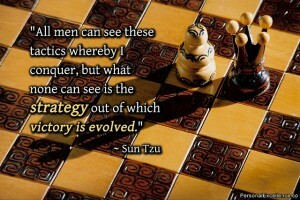 Strategists also understand the importance of leadership . New ideas and practices rarely take off without concentrated effort and focus of leaders. For the rest of October, I will be exploring how project managers can become strategists. You don’t have study Napoleon (though I have and I welcome you to do so). You don’t need to be a current or former executive to become a strategist. You do need an understanding of where your organization is going. If you’re used to focusing exclusively on your department’s concerns, you will need to think more broadly. Strategy is an essential skill to learn if you seek to manage programs and portfolios of projects. If you aspire to join the C-suite, it is mandatory. Stay tuned for interviews with strategists and other insights exploring strategy for project managers. Pingback: Are You A Pawn Or A Strategist: Keys To Project Leadership | Nead & Co.
Great article, Bruce! I’m seeing more focus on strategy in the last year, and know that more organizations are thinking about alignment between projects and strategic goals and objectives. Thanks for including the Ryan Holiday’s list! Many of the books on the list are new to me, and I’ll be adding quite a few to my reading list.